The museum – gallery of Ev. 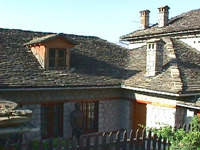 Averof – Tositsas is located at Metsovo of Ioannina. It is a creation of the Foundation of Ev. Averof – Tositsas and operates like a museum of modern greek history with 250 exhibits, the majority of them from the personal collection of Ev. Averof. It is housed next to the Garden of Averof at the central square of Metsovo, and is a donation of the founder of the gallery Ev. Averof, in a three – floor buliding of a great architecture of the five exhibtion halls. The auguration of the building and its exhibits was on 27th August in 1988. In the gallery are exhibited mostly paintings of famous painters of the 19th and 20th century (Gyzis, Lytras, Maleas, Chatzikiriakos – Gkikas, Tsarouchis, Fasianos, Parthenis, Moralis and many other modern creators). This collection is considered as one of the most complete of this age. Its paintings show the history of the Modern greek painting. In the Hall of Painting and Engraving are exhibited works of Greek painters and engravers of the same period, a Dimitrios Tsamis’ donation. In the Hall of Modern Artists there are works of modern Greek artists. One of the most important exhibits is the “Explosion of the turkish navy by Kanaris” by Nikiforos Lytras. In the gallery also take place many exhibitions, other events, conferences, etc.